Nevada City native Alexander Rossi won the 100th Indianapolis 500 for Andretti Autosport this summer. He was the first Californian to win the race since 1955. As it turns out, the winning Indy 500 team is into California wine, not just race cars. Andretti Winery in Napa was founded in 1996 by Mario Andretti. Rossi, of the Andretti team, visited Nevada City in September for the 50th annual Constitution Day Parade. He received a hometown hero’s welcome. The Gold Miners Inn/Holiday Inn Express hosted a dinner for Rossi, and an IndyCar was parked in front of the hotel for viewing. Never mind the oak barrels. 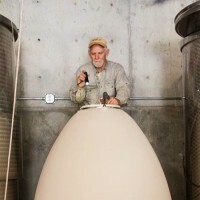 Sierra Starr Winery now has a concrete fermenting egg for its sauvignon blanc program, a growing trend. We also have seen a fermenting egg at Andis Winery in Amador County. 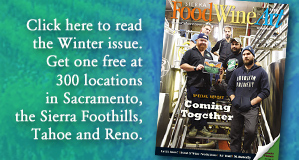 “Wine fermented in concrete has the round mouthfeel of wine fermented in oak, but it has much greater purity of fruit flavor, even a greater intensity of fruit color,” as one manufacturer puts it.” We can’t wait to taste Sierra Starr’s “new” Sauvignon Blanc. This summer we inspected the oldest known bottle of local wine at the Nevada County Fair. It was a 1978 Petite Sirah produced and bottled by Pine Hill Winery. “Produced and bottled by Rod Byers, Grass Valley, California,” the label reads. “I believe it to be the oldest wine in existence produced from locally grown grapes,” says Byers, who started the wine competition at the Fair in 1984. The grapes came from a 7-acre vineyard planted in 1974 by cattle rancher John Callender, whose son, Rea, is CEO of the Fair. Rod is a wine judge and longtime marketing director of Nevada City Winery. Bent Metal Winery has opened a new tasting room at 163 Mill St. in downtown Grass Valley. It is open Thursday-Monday from 1-5 p.m. and one hour later on Saturday. Visitors can sample Bent Metal’s wine and nosh on artisan cheeses and other snacks. The tasting room, set in a restored Gold Rush-era building, also sells bottles of wine and wine glasses. It is the fifth wine tasting room in downtown Grass Valley— joining Smith, Lucchesi, Sierra Starr and Avanguardia. Smith Vineyard has released Rylie’s Red and Wyatt’s White to honor its fourth generation. Rylie and Wyatt are the grandchildren of the owners, Chris and Gary Smith, and great grandchildren of the winery’s founder, Dr. Wayne Smith. Now the winery is releasing Dekker’s Duo, a red wine blend of cabernet sauvignon and shiraz. Smith’s wines are organic and estate grown. New red wine releases, dancing on the crush pad and a feast of baby back ribs, stuffed grilled jalapeños, shish kabobs and more is featured at Andis Wines’ “Redneck BBQ Bash” release party on November 5. Tickets include a commemorative wine glass. The Andis vineyard in Amador County includes about 20 acres, including Zinfandel, Barbera, Grenache and Malbec. Its tasting room featuring large window over-looking the surrounding vineyards and a 26-footlong tasting bar fabricated from sustainably harvested Lyptus wood.